Brighton’s expertise in Fitness-For-Service (FFS) assessments is supported by a team knowledgeable in FFS techniques to determine whether damaged equipment can continue to be safely used. We have performed evaluations for reactors, vessels, tanks, truck frames, and pipelines using API 579/ASME FFS-1 methodology. Our analysis investigates the underlying damage mechanisms leading to a material’s fatigue and fracture. Brighton’s team is up-to-date and involved with FFS research, such as our submission to API/ASME to support changes to a Level 2 assessment methodology for thermal hot spots. With experience ranging from simpler Level 1 to rigorous Level 3, Brighton’s ability to apply the right approach results in cost and time savings to clients. 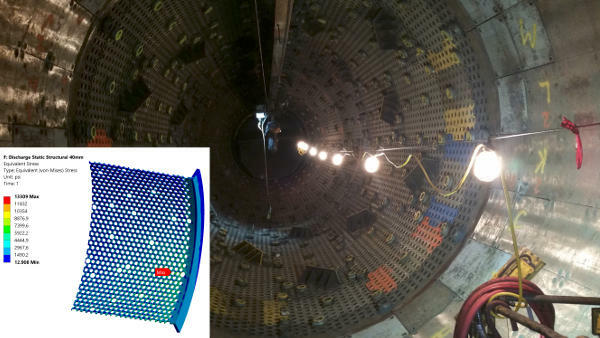 Brighton’s engineers combine expertise and extensive industry knowledge along with skills in a variety of Finite Element Analysis (FEA) platforms to quickly solve real world problems pertaining to in-service failures. We apply sound engineering principles and are prepared to assist urgent investigations by offering expert opinion. Our engineers can quickly mobilize to gather data from physical inspection and measurements or by reviewing as-built installation drawings of equipment to set up practical 2D & 3D models. 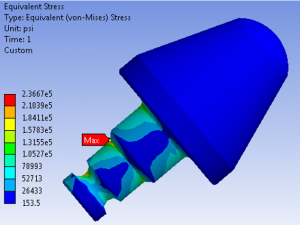 These models accurately predict stresses, strains, displacement, fatigue, ratcheting, vibration, and thermal heat transfer to assist in determining failure modes. 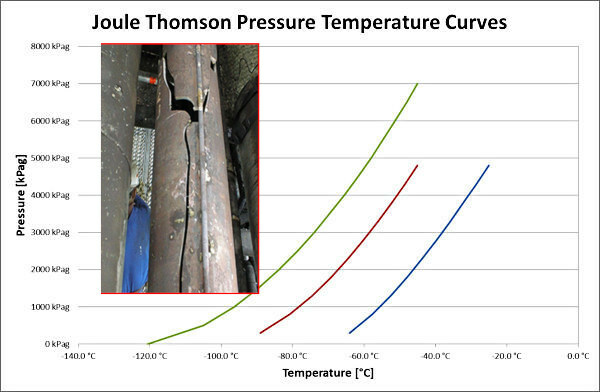 Carbon steel toughness and ductility degrades with decreases in temperature, so designing equipment and selecting materials properly in the design stage, can prevent severe safety and equipment failure leading to injury or loss of life, loss of product and production, and all the costly consequences. Existing brownfield facilities can be analyzed by Brighton for Brittle Fracture potential under severe conditions, such as a blowdown event. Brighton can work with your engineers to help develop low temperature mitigation procedures, recommend mechanical stress-reduction installations, re-rate equipment to operate under more severe conditions utilizing Fitness for Service methodology, and in the worse-case provide material replacement recommendations in critical locations. 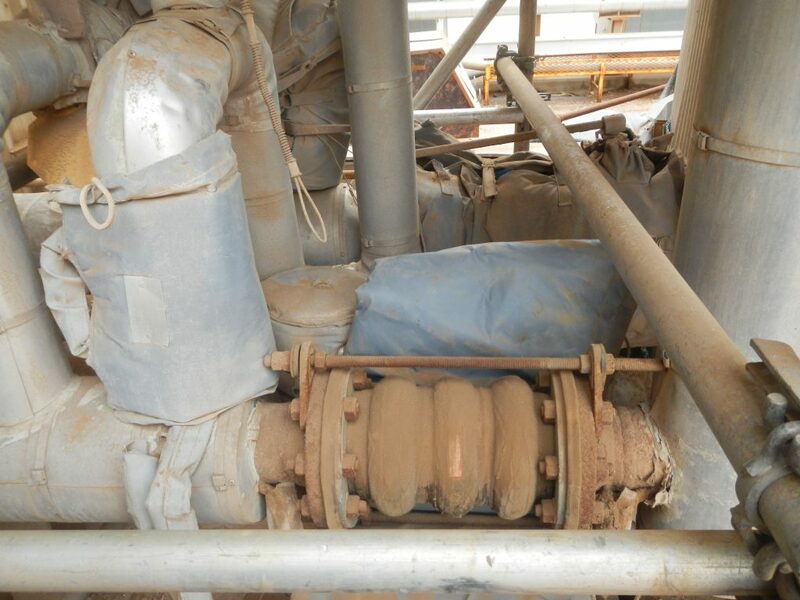 Billions of dollars are spent annually by oil sands surface mining facilities on maintenance, replacement and repair of equipment and piping due to excessive wear and corrosion, in addition to the consequential production losses from premature failures. Oil sand is mainly composed of hard quartz, sand, silt, clay, water and bitumen. The presence of quartz and other hard solids in the oil sands has posed unique material challenges for oil sands operators. 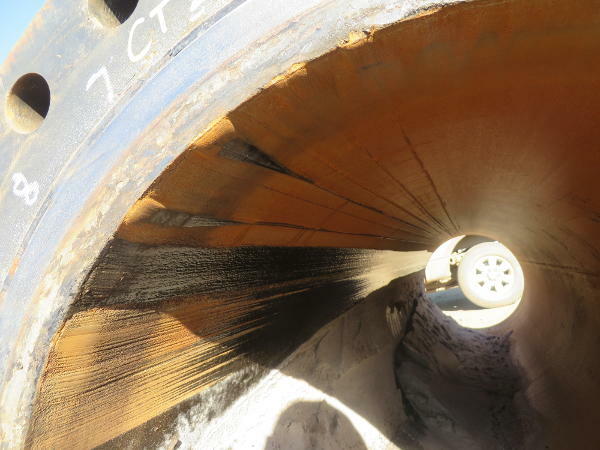 Brighton engineers have assisted oil sand surface mining operations with developing and implementing material technology solutions to reduce the reliability impact caused by wear, erosion, and erosion-corrosion. Since 2014, Brighton has contributed an estimated operating (OPEX) cost savings of more than $45 million dollars to oil sand facilities. Water hammer occurs when there is a pressure wave generated from a fluid that is forced to stop, start, or change direction suddenly. In the case of steam hammer, there is a mixture of steam and condensate instead of fluid. These situations are common when a valve within a piping system is shut-off or turned-on. 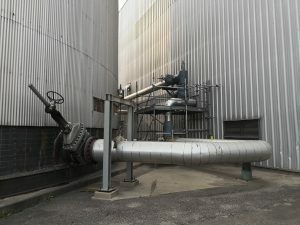 The pressure wave induces vibration and reactionary forces on the pipe that can compromise safety potentially causing injury to nearby personnel and severely damaging the piping and equipment, which can otherwise cause preventable downtime. Brighton’s engineers are able to investigate the mechanisms behind water hammer sources and piping failures in both liquid-filled and two-phase steam-condensate systems. 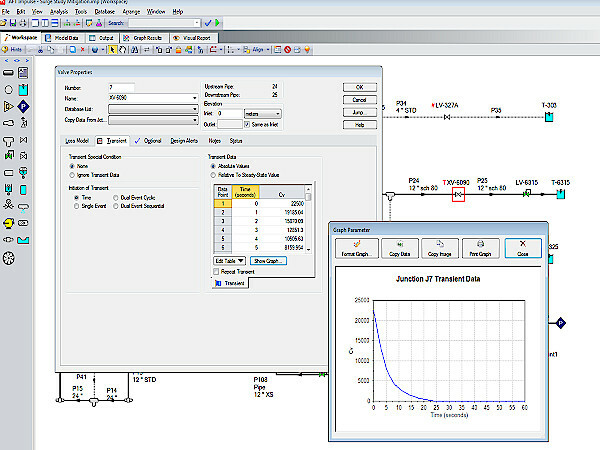 We can analyze the fluid flow at all stages of operation, simulating the increased pressures, vibration, and forces during the event and the mechanical response due to the increased loads on the piping systems. From application to elimination, Brighton has the expertise to design and modify a piping system to work with or without specialized piping joints. Expansion joints are widely used when a ‘tight’ piping system does not permit the flexibility necessary to absorb axial and lateral movement, generally at the expense of robustness and longevity when compared to hard pipe. Brighton has a long history of providing sound alternatives to replace ineffective or leaking expansion joints. Swivel joints are often used in two or three ‘knuckle’ combinations to absorb large differential movement. Incorrect design often leads to ineffective movement of the knuckle arrangement leading to possible damage or leaks. Brighton has performed evaluations on hundreds of knuckle combinations and can provide the most effective design for any scenario. Clamp Joints are often used in severe operating conditions where spool removal is necessary, however they can be susceptible to leakage if put under incorrect bending loads. Brighton can assess existing clamp joints for root cause failure, and modify piping to alleviate unnecessary loading to keep the joints fit and in service. At Brighton, our process engineers focus on designing optimized systems through computer-based methods. We have experience with SAGD central processing facilities and wellpads, upgraders, and refineries. After the processes are refined, our designers are able to detail the process and create Process and Instrumentation Diagrams (P&IDs). These drawings will then be issued and approved under the designing engineer. Our process engineers also provide support to our Fitness For Service experts. At Brighton, we add value to Fitness For Service and stress evaluations with our ability to take thermal images. Thermography could help uncover the root cause of your damaged asset by capturing real-life data for further engineering analysis in a Finite Element Analysis (FEA) software. When assessing stress or fatigue, an engineer would assume a temperature based off of the design conditions which can result in an approximation of stress and not be reflective of reality. 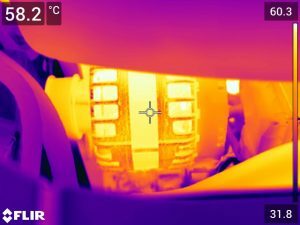 By taking thermal images, we could acquire actual temperatures in a non-invasive manner to create a more accurate assessment of equipment or piping. We offer 3D laser scanning to complement our engineering services. Our trained technicians can scan equipment for dents and bulges to create highly accurate models. 3D laser scanning is a value-added service to our Fitness For Service, Cold Brittle Fracture prevention, and Finite Element Analysis (FEA) expertise.